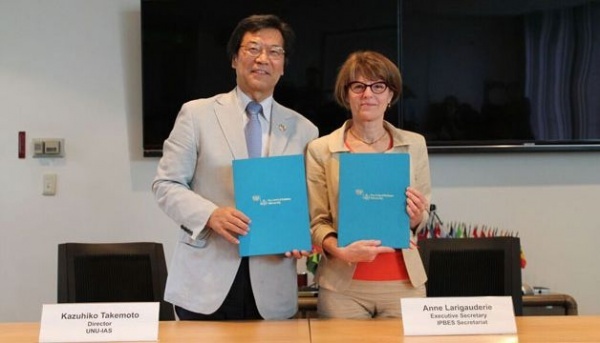 The United Nations University Institute for the Advanced Study of Sustainability (UNU-IAS), host of the IPSI Secretariat, recently signed a Letter of Agreement (LoA) for expanded cooperation with the Inter-governmental Science-policy Platform on Biodiversity and Ecosystem Services (IPBES) at a formal event at UNU headquarters in Tokyo, Japan. According to the UNU-IAS website, with this agreement, “both partners expressed their intention to identify opportunities for additional cooperation in the areas of capacity building, indigenous and local knowledge systems, and knowledge and data. Their overlapping mandates offer the potential to expand their existing collaboration and develop more joint activities, and at the same time support internationally agreed environment objectives and the Sustainable Development Goals.” The agreement mentions IPSI, along with other UNU-IAS projects, for our potential to “offer IPBES closer access to stakeholders at the sub-national and local levels, especially in areas such as biocultural diversity and sustainable development”. For more information, please see the event announcement on the UNU-IAS website here.